Any company operating in the Democratic Republic of the Congo (DRC) can tell you one thing with certainty – the country lacks some of the infrastructure that is needed for operating safely and efficiently. While it is a country with vast resources, according to a 2011 study by The World Bank, the country had less than 3,000 kilometers of paved roads while the remaining 30,000 kilometers is largely unpaved and in various stages of accessibility. This lack of road infrastructure is of great concern for mining companies. Workers travelling to and from remote mining sites face long and dangerous treks across ill-maintained roads with potholes as big as three meters. 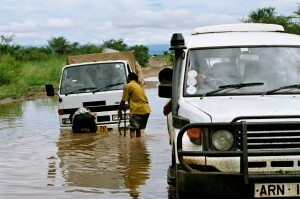 A journey that would normally take a few hours on a well-paved road will often take many days in the DRC. One Canadian mining company decided to take a more proactive approach to the safety of their contractors, geologists and managers travelling in the DRC for exploration work. Focused on reducing the number of accidents and increasing the overall security of their travelling workers, the mining company turned to Inmarsat, a provider of global satellite services, for a solution. Looking at the situation, Inmarsat recommended that the mining company opt for FleetInt, an asset management and vehicle tracking solution, in combination with the IDP-780 dual satellite-cellular tracking devices. The solution would allow the mining company to fully track the vehicles travelling to exploration and mine sites. The tracking devices used by the mining company are not your average GPS tracking devices. While they track and report the location of the vehicles, the devices are also part of an overall fleet management solution that helps to enforce a number of business rules designed to change driving behaviours and increase the safety of personnel. One of the first business rules implemented by the device was journey management, where the speed of the vehicle is tracked every minute. If the device detects that the vehicle is travelling above 80 kilometers per hour, a notification is sent to the local office. The intent of the rule is to reduce the number of accidents caused by driving through thick dust clouds or kicked-up gravel on rough and unpaved roads. The rule also helps to reduce wear and damage on vehicles that hit potholes and other obstructions at very high speeds. 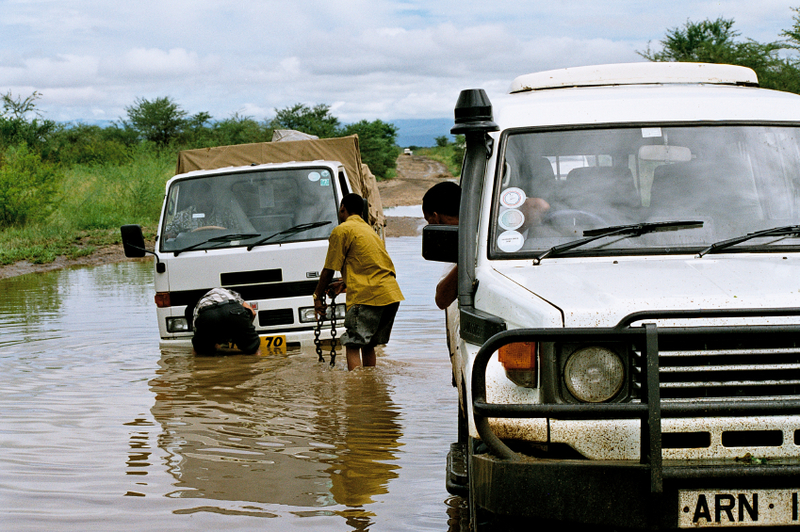 The journey management function also plays a valuable role during the rainy season. Tracking the location and speed of the vehicle helps to determine if it may be stuck in thick mud and in need of towing assistance. Another rule was to impose a time-of-day driving curfew. Vehicles are not allowed to travel after dusk when there is insufficient light on the roads. Travelling in reduced visibility conditions not only increases the risk of accidents but also the risk of fatalities due to collisions with pedestrians or livestock. Electronic geofences around the perimeter of the base camp ensure that vehicles stay within an allowable distance where help is easily accessible. If a vehicle exits the allowable area, a notification is immediately sent to the local office for investigation. Geofences are also used to readily identify high-risk areas. If a vehicle is detected travelling in prohibited areas, the mining company is able to work with local police or military to investigate the situation. According to the World Bank, all the major population centers in the DRC have competitive GSM wireless communication coverage but service availability is not uniform across the country. For the mining company, a fleet management solution that only used GSM was not a viable solution as it could not communicate reliably and cost-effectively in remote areas and allow them to enforce the business rules. To get around the issue of lack of GSM communication in remote areas, the mining company opted for a dual satellite-cellular tracking device. The device uses the GSM service when it is available and automatically switches to Inmarsat satellite service in areas with no cellular coverage. The availability of satellite communication allows the mining company to receive real-time notifications of events like collisions and vehicles travelling during prohibited times or entering high-risk areas. The availability of satellite communications is also an important feature for immediate notification during an emergency. All of the company’s vehicles are equipped with a panic button which, when engaged, sends a notification instantly via satellite to officers of the mining company for immediate action with the local authorities. Aside from tracking personnel vehicles, satellite is also being used to track haul vehicles. In Western Ghana, a gold mining company was faced with the dilemma of choosing between building a new gold mill at a new site or milling at an existing site located 80 kilometers away. Building a new gold mill would carry a substantial initial cost in infrastructure, so the mining company decided instead that it made financial sense to transport ore to their existing mill site. While this decision helped keep major capital investment costs down, the mining company was faced with the challenge of how to track their trucks to eliminate both ore and fuel theft. Since Western Ghana currently does not offer the consistent and reliable cellular communication coverage that is required for security-based applications, the mining company opted for a dual satellite-cellular tracking device to track and monitor the location of the trucks. The end solution uses fuel-level and cargo-weight sensors for monitoring the amount of fuel consumed as well as the amount of ore in the vehicle. The solution also enables two-way communication between drivers and the office when there is no cellular coverage. Drivers are now able to let the appropriate recovery teams know if there is a road obstruction, a malfunction, or other issue that is slowing or halting movement. The availability of satellite communications is now becoming an important consideration in any well-planned and implemented asset management and vehicle tracking solution for multi-national companies. The safety and security offered by a dual communication device allows companies to fully track workers and vehicles travelling through vast areas over difficult terrain.